This 1977 recording brought together many of Mali’s finest singers and musicians, at a time when the country had not yet celebrated twenty-years of independence. 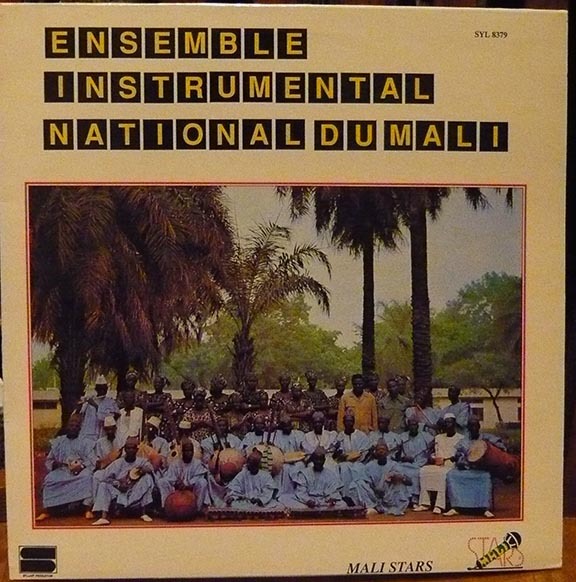 Groups like this one were part of a larger project of nation-building, creating a Malian musical identity out of many different ethnic traditions: Griot, Malenke, Wassolu, and others. Though the Ensemble used traditional instruments, it was doing something very bold: making music for a new country to call its own. It featured vocalists Hawa Drame, Mande Kouyate, and Cumba Sidibe (who passed away a little over a year ago in New York City); and musicians like Djelimbadj Sisoko, probably better known as a member of Bamako’s famous Rail Band. In the course of my “research” (not sure if you can really call it that…), I came across a Dutch blog called World Service, which I recommend. This entry was posted in PELANGA RECORDS! and tagged Cumba Sidibe, Djelimbadj Sisoko, Ensemble Instrumentale Nacional du Mali, Hawa Drame, Mali, Mande Kouyate, Wassolu by Franz Tunda. Bookmark the permalink.